We didn’t do anything here at The Hayride on the tragic death of Baton Rouge Metro Councilman Buddy Amoroso a week ago Saturday, mostly because Amoroso’s loss was very personal – he was a great friend to us – and what we had to say about his death and the individual who caused it by running him over on a West Feliciana Parish highway wasn’t fit to print. And one reason for that was our thoughts tended to the political, which we weren’t comfortable with at all. It seemed very crass to discuss the implications of such a tragedy on something so petty as a Baton Rouge Metro Council seat and/or the potential successor to Rick Edmonds’ state legislative seat should Edmonds win the race for Secretary of State this fall. Amoroso, after all, ran unsuccessfully for that District 66 seat in a 2015 special election won by Darrell Ourso, whom Edmonds defeated in the fall of that year; there were rumors Amoroso might try again if Edmonds won. But we didn’t feel comfortable discussing that. Not when what mattered was the loss of a friend in a stupid accident brought on by criminal negligence of a bad driver who couldn’t see people riding bicycles in broad daylight. Talking politics after such a terrible human story seemed below the line. And so we didn’t. Choosing a progressive Democrat to fill the vacant District 8 council seat would be a tremendous blow to the St. George effort! This came amid a truly ugly move by Banks and three of her Democrat colleagues on the Metro Council – Donna Collins-Lewis, Lamont Cole and Erika Green – who put out a press release this afternoon saying they will abstain from voting on a replacement for Amoroso on the Metro Council. With Amoroso gone from the 12-member council and those four abstentions, the replacement would need a unanimous vote from the seven others – the six remaining Republicans and Democrat Tara Wicker – in order to succeed Amoroso. The Metro Council will meet July 18 to vote on a replacement for Amoroso, who was killed June 30 in a bicycle accident in West Feliciana Parish. The replacement is to be nominated by Amoroso’s family. No word yet on whether his wife Denise will take up his position on the Metro Council. But if no replacement is named, or the seven Metro Council members available to vote on the replacement can’t come to a unanimous decision, then the job of replacing Amoroso will fall to Gov. John Bel Edwards. That’s what those abstentions are aimed at producing. Had Banks and her partisan clown posse been able to add Wicker to their side they would have been able to prevent Amoroso’s family from replacing him without the possibility of a vote. As it stands Wicker is in a position to veto the replacement and send it to Edwards, so it isn’t quite time to commend her on her civility just yet. And if she does exercise that veto, we’ll go from having a 7-5 Republican-to-Democrat split on the Metro Council to a 6-6 split. What we won’t have is anything different in terms of the St. George incorporation effort, which has precisely nothing to do with the Metro Council. In making the statement she made Banks demonstrated a failure of basic civics as well as one of human decency. For a time after Denise Marcelle left the Metro Council there was some room for disagreement as to who its worst member is. Now that’s gone. Now we know Chauna Banks has the title. She’s lower than pond scum. Let’s make her famous. It is hard to describe the disgust I feel right now with the decision of Erika Green, Councilman LaMont Cole, Chauna Banks, and Donna Collins-Lewis. They have collectively spit on the grave of their colleague. Earlier today, they issued a press release that they would abstain from supporting a replacement for his seat. 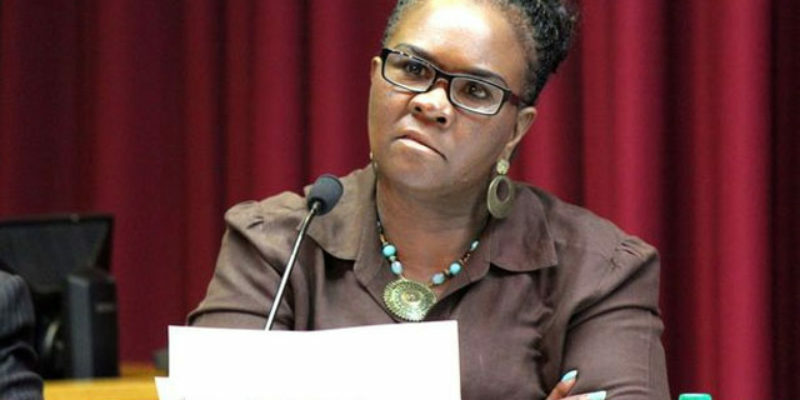 Mind you that both Erika Green and LaMont Cole were appointed to fill the unexpired terms. How quickly they forgot how Council members were asked to not support either appointment, but we did not abstain. God, I wish I had now. This is not how you honor the memory of a man you served with. Or his constituents. It’s today’s like today that I reflect on Buddy’s legacy of working across political and racial lines. I so appreciated that about him. 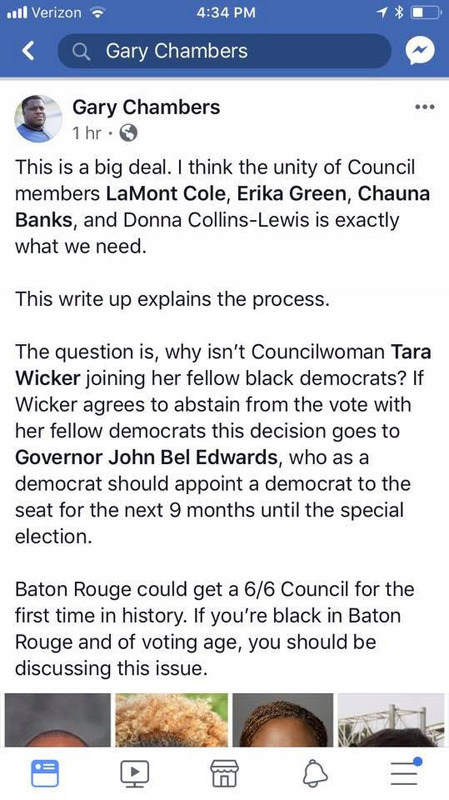 I am disgusted by this decision from Erika Green, Donna Lewis, Councilman LaMont Cole and Chauna Banks. This move marks an all time low for politic discourse in Baton Rouge. Previous Article Did you know Obama held illegals in CAGES?